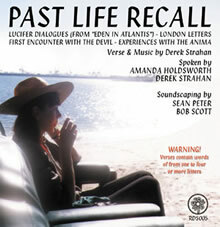 "PAST LIFE RECALL" RDS005 Verse & music works by Derek Strahan. Spoken by Amanda Holdsworth & Derek Strahan. Soundscaping by Sean Peter & Bob Scott. Total duration: 77'09"
Presenting verse & music works in dramatic readings with music and soundscaping. All the verse is intended eventually as libretti for future use in musical compositions - either opera or song cycles. 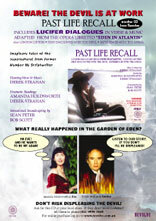 "Lucifer Dialogues" is a narrative drawn from the libretto for "Eden In Atlantis", which is being developed as the first in a 4-opera cycle on the subject of antediluvian civilisations (The Atlantis Project). "Past Life Recall" and "First Encounter With The Devil" offer different versions of the same fictional event - a Rashomon-like exercise in contrasting female and male perspectives. "Past Life Recall" and "Experiences With The Anima" were both published by Crucible Press in the 1987 volume of verse by Australian writers, "Public Poetry Vol.1", a collection of poetry declaimed at weekly poetry readings at Watson's Bay, a harbourside suburb in Sydney, Australia. Read text for "Lucifer Dialogues"
Read text from program notes: "Devil In The Derail" - a short history of the Devil. Listen to "Eva" from "Lucifer Dialogues"
Listen to "Faults" from "Lucifer Dialogues"
A message from Captain Xog: "Greetings carbon-based life-forms, and may you derive health and long life as a result of resonating to these auditory signals facilitated by cognitive pathways laid down to further the glaring self-interest of our species here cunningly disguised by this well-wishing." Derek Strahan: voice, guitar, harmonica, keyboard for virtual bass and additional virtual instrumentation. Sean Peter: keyboard for all virtual percussion & FX, virtual rock band (Track 10), virtual organ & strings (Track 11). Derek Strahan left school teaching to become a full-time script-writer for Australia's first TV serial "Number 96", and song-writing gave way to writing film and concert scores. The songs in this selection are from analogue tapes made over the period 1960-1974, mostly of voice, guitar and harmonica only. In the process of digitally remastering these Derek has added bass lines to most songs, and sometimes extra instrumentation and effects. Special thanks to Sean Peter for his creative contributions during the process of digital remastering. 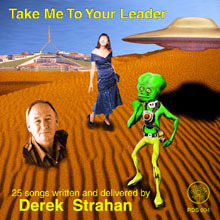 Listen to "Age of the Artificial Man"
Listen to "Take Me To Your Leader"
Music & Libretto by Derek Strahan. This work is a cycle of 9 songs about various aspects of the city of Sydney, Australia, viewed subjectively in the form of memories of a personal relationship. 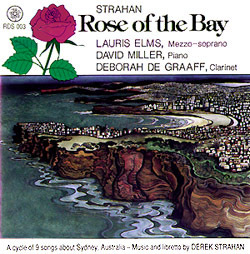 It is scored for mezzo-soprano, clarinet and piano, and was commissioned by Lauris Elms, OBE, who gave the first performance at the Sydney Opera House in November 1987, with Deborah de Graaff, clarinet (her daughter), and David Miller, piano. In the following month these artists made a studio recording of the work for the Australian Broadcasting Corporation, who kindly gave permission for the release of this recording on the Revolve label. Listen to After from "Rose Of The Bay"
Read more about "Rose Of The Bay"
The cover shows portraits of two women - one, a woman of this century (Today), the other, a woman of two hundred years ago (Yesterday). Each work is a musical portrait corresponding to the pictorial portrait. The music was composed in response to synchronistic events taking place in the composer's life in 1980/81 while work was in progress. Both works are strongly melodic, employ compound harmony and polyphony, and apply dance metres derived from jazz & pop music. A classical four-movement structure is used . The String Quartet may be described as neo-romantic. At one level the Clarinet Quintet invokes the 'swing' legacy of Artie Shaw & Benny Goodman; at another level, in structure, it invokes the period of Beethoven. The 1981 analog recording has been digitally remastered with excellent effect. The performers are: John Gould, Irene Donohoe, violins; Jane Hazelwood, viola; David Pereira, cello; Alan Vivian, clarinet. Listen to Fever from "The Key"
Listen to Love Music from "The Key"
Listen to Jazz from "The Princess"
Listen to Constancy from "The Princess"
This is an anthology of music written for various film productions during the period 1965/75. Many of these were film documentaries about Australian wild life made by Robert Raymond ("Shell's Australia - 13-part TV series). Others about Australia insect life were made by Densey Cline and Jim Frazier ("Aliens Among Us", "Garden Jungle"). Some Suites of music from this source also feature on Jade CDs, and full versions of these and other feature film sound tracks are being prepared for release on Revolve. In the meantime this rather nostalgic anthology remains available (in dwindling numbers) in its original Cassette form. Many well known performers are featured both from the Sydney Symphony Orchestra and from the Sydney jazz scene of the 60's and 70's.